Editor’s note: Iran was born and brought up in Iran. 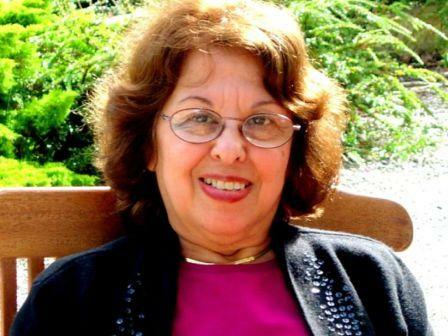 She writes here of her early years, and her experience of moving to the UK in the early 1960s. I was born and raised in a Bahá’í family in Mashad where I spent a sheltered life. I was sent to England for further studies after high school, arriving in London in April 1961. So, imagine an Iranian teenager alone in a strange country with only a little knowledge of English, thrown in at the deep end. No Persian rice dishes ready on the table, no friends dropping in casually and no more guaranteed sunshine. I knew just one friend from back home who was here already and she showed me the ropes of how to enroll at an English Language College, how to open a bank account, how to find a hostel in Holland Park in order to live cheaply, how to use the underground and most importantly to remember to say please/thank you and sorry, every few minutes. I can’t remember seeing any Bahá’ís for the first few months. I was concentrating on learning English, passing exams, and starting a secretarial course at Pitman’s College in September of that year. I was a young girl who had found a whole new exciting world. My whole Bahá’í experience in Mashad had been at Friday classes for Bahá’í children, an occasional 19 day Feast and frequent memorials for the dead, where as a kid I had to sit quietly for what seemed hours on end. One lesson learnt was the discipline of being quiet and respectful. “I also remember a couple of visits by Mr. Furutan (Hand of the Cause of God) to Mashad which had a big influence on me and I found his talks spell-binding even for a child. My maternal Grandfather Mir Ali Asghar Oskui and my paternal Grandfather Mirza Agha had both spent a few months serving ‘Abdu’l-Bahá in the Holy Land, taking dictation from Him and transcribing them in beautiful calligraphy. They both had received tablets revealed in their honour by ‘Abdu’l-Bahá. I never saw them as they had passed away before I was born but my recollection of our own household is that we were just the average Bahá’ís. The only powerful spiritual experience for me was the effect of the passing of Shoghi Effendi when the news reached us in November 1957 in Mashad. We were distraught, forlorn and felt orphaned. There were big meetings nearly every night and all the Bahá’ís just wanted to cling together, comfort each other and share their profound grief. I was a young teen-ager and I clearly remember how devastating the news was. So, soon after arriving here, I wanted to visit the resting place of Shoghi Effendi and my friend took me there. I remember that both of us knelt down putting our foreheads on the white marble gravestone and just sobbed. On seeing our desperate state a kind Bahá’í approached us and asked “Are you all right? What could you possibly want from God that you are crying so much?” We somehow conveyed that we were not asking God for anything special, it was just the outpouring of our inner feelings. There was only one spiritual assembly in London at that time, and I heard about the Thursday public meetings at the Bahá’í Centre (Haziratu’l Quds). So I started going there when I could and taking a friend with me occasionally. One vivid memory of these evenings is the presence of Betty Reed, the secretary of the National Spiritual Assembly at the time. Her enthusiasm and certitude was infectious. She radiated joy and I can still hear her confident voice and delivery when I think of her. Nineteen Day Feasts and other events were also held there. So that was the only place I could meet the Bahá’ís and feel the warmth of the Faith. This was an unforgettable event. It was also the year that I got married. My mother from Iran and my brother from America came to London, as well as many friends from all over the globe for the World Congress. Just arriving outside the Royal Albert Hall and seeing all those Bahá’ís saying Allah’u’Abha freely, talking, embracing and being so joyful and excited, was dreamlike. This kind of freedom had never been in my experience. Back home I had had to hide my Bahá’í prayer book under my coat when I walked to children classes for the fear that I might be recognized as a Bahá’í child and become the target for verbal abuse by the ignorant passers by. Inside the Congress hall, the atmosphere was electrifying and the sense of pride and achievement was palpable. A couple of years after this, my husband John and I moved further out to New Malden, Surrey where I brought up my two sons. I lived there as an isolated believer, without much contact with the Bahá’ís. I couldn’t drive and couldn’t easily travel to the London Bahá’í Centre. So my soul did not receive the spiritual nourishment of being with other Bahá’ís. Those were the difficult years in every way. One day I heard of a meeting at the Bahá’í Centre (27 Rutland Gate) with Mr. William Sears (Hand of the Cause) speaking, and I made an effort to get there. Looking back I feel what a privilege that was. After the meeting I was able to say a few a words to him. I explained I was married to a non-Bahá’í, had no other family or Bahá’ís around me and I did not know how to bring up my son (my first son Antony aged about four) with the knowledge of the Faith? I can’t remember all that he said, but he assured me that he was on his way to the Holy Land and he would pray for me and my son at the Shrines. A little time passed. I had another son (Mark) and was still isolated. One day I heard about a Bahá’í public meeting in Epsom Surrey and I went there. I met Phillip and Ann Hinton and Patrick and Christine Beer. Their love and welcome was overwhelming. I went to their Nineteen Day Feasts and other events when I could. I’d been away from the Bahá’ís so long that I could not read a prayer properly. But the spiritual atmosphere drew me to them and their meetings. They invited my sons to children classes and I took them every Sunday to Epsom. I owe it to the prayers of Mr. William Sears and to the love shown to me by the Bahá’ís of Epsom for the bounty of having been able to raise my sons in the Faith. In the 1970s, there were wonderful Bahá’í summer schools that I attended with my sons, although the accommodation and the food were something less desirable. We listened to people like Mr. Adib Taherzadeh, Mr. Ugo Giachery, Prof. Soheil Bushrui. I also recall attending some talks given by Amatu’l-Bahá Ruhiyyih Khánum and Mr. Furutan in London. Each talk was like a gem that remains imperishable and lasting. I may remember only one sentence from each, or just the powerful spirit of the occasion, but those alone were inspiring enough to sustain me a whole life time. From Mr. Adib Taherzadeh’s talk I remember: Deepening is not just reading the Writings. True deepening is when we deepen our love for Baha’u’llah. And on another occasion with Prof. Soheil Bushrui I asked “How can we live up to the Bahá’í ideals – they are so lofty that we can never reach the height expected of us and therefore remain feeling guilty?” He explained roughly that the standard is very high; if we fail, we should try again. So feeling guilty is a good reminder that we should adjust our actions. Another piece of valuable advice from Mr. Furutan was to have a framework in life and put the Faith in the centre of it, then arrange all other activities such as work, family, entertainment around that. This was in contrast to the idea of putting ourselves in the middle and everything else including the Faith around us. This vivid picture of how we should be God-centred (or principle-centred) has always remained with me. New Malden was in the Borough of Kingston upon Thames and I considered myself the first Bahá’í there (not sure if any Bahá’ís actually lived there before me). Then another couple of Bahá’í families came to settle there and sometime about 1975 I received a call from Bijan Iqani a Bahá’í, to say that by then a few Bahá’ís were in the Borough of Kingston upon Thames and we should form a group. He must have had the information from the Bahá’í Centre. So we met up at the house of Mrs A Golmohammad and started our own Nineteen Day Feasts, our own children’s classes and firesides. Soon our numbers increased to nine and we needed to form our own LSA. Mrs Mary Hardy came to represent the National Spiritual Assembly on this auspicious occasion of our formation: 2nd October 1977. Apparently Kingston upon Thames was not a goal area, but it became a bonus LSA helping to increase the number of LSAs in the UK. To be a member of the LSA seemed so awesome that I felt totally inadequate and unworthy, but it was my duty to serve. I was elected the secretary at the first meeting and for the next 23 years, I was the secretary, vice chair or chair of the LSA until I moved to Epsom Downs (near Epsom but in the Borough of Reigate and Banstead) in 1998. At the following Ridván Election I was elected to serve on the LSA of Reigate and Banstead, but with the boundary changes in 2001, once again I became an isolated believer. 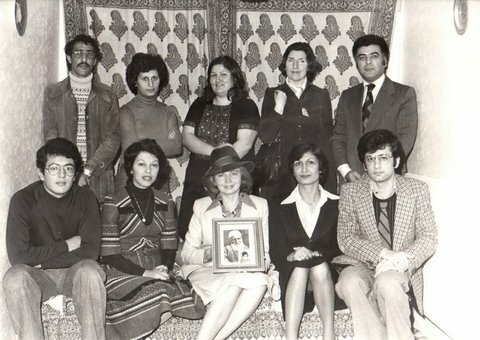 Iran Jolly is seated second from left in the front row. Mary Hardy is in the centre. It was really interesting to read your story. I thought that you were really connected with God. I took it as a miracle that you had a chance to express your feelings with Mr. William Sears (Hand of the Cause) at the Bahá’í Centre (27 Rutland Gate). His prayers were really helpful for your sons that they were given opportunities to be raised among the Bahá’ís of Epsom. Congratulations for getting an opportunity to serve in the first LSA of Kingston upon Thames. Wasn’t this also nice to get another opportunity to serve on the LSA of Reigate and Banstead being an isolated believer? I see you as a candle light of the Faith to enlighten other souls. Let us begin praying for each other and for other seekers in the world. Thank you Datta Tray Roy for your kind comments which also touched my heart. I just re-read this again and appreciated it even more than the first time. I loved some of Iran’s memories from Mr. Faizi, Mr. Taherzadeh, and Suheil Bushrui. Thank you so much for this. Dear Iran Jolly. I read your story with much interest, even taking note of some of your comments especially re talk with Mr Faizi. Also of interest for me were your childhood memories in Iran and your learning respect and quiet during celebrations. Your story in fact brought home to me the similarities of our lives (Australian and Iran), I also going to a strange land and having to learn a new culture and language, also being married to a non Baha’i. But thankfully I now have a wonderful strong other wing, a Baha’i lady of this land who is a great assistance in service. You are most fortunate to have Baha’i children, and I am very happy for you. I spent two years in England, mainly in the Cleethorpes and Grimsby areas, but as a child with my parents, as my father was English, and his family of sea-going fishermen still ply their trade in the English Channel. I often wonder if there are any Baha’is in the areas I mentioned. I am sure there are; they may know of my family there.